In my experience, the most moving concert experiences are not the ones you expect. Usually, this has to do with the scenery. Small clubs with a band I just discovered, maybe even as recently as when they took the stage, are usually the ones that catch me by surprise. For big-name concerts, the tickets I can afford are usually closer to the parking lot than the stage. I find myself on the lawn, where it inevitably rains and I end up with some calcified mix of mud and beer on my shoes. Or, if I’m lucky, I might be in the nosebleed section at a stadium show, which seems to have a back-of-the-class effect on the crowd. Since they’re so far away, they think, they may as well just chat and get a little rowdy, as if we were in the back of a fifth grade classroom. Both scenes come complete with spitballs and brown paper bags. Last year, I found myself particularly moved by a show not just because of the artist but also because of the crowd. 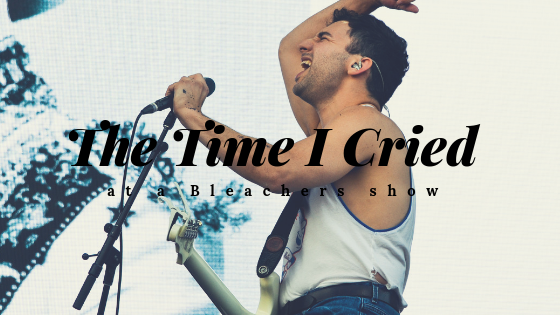 For years now, I’ve been a huge fan of the band Bleachers and its frontman Jack Antonoff. He is well-known for working on many of today’s biggest pop albums (Taylor Swift, St. Vincent, Lana Del Rey, and many more) but when I saw Bleachers last year at the All Things Go music festival, I didn’t realize just how beloved they were in their own right. Bleacher’s mix of modern pop and classic rock aligns perfectly with my sensibility but it’s not something I hear much of on the radio or even on Spotify, though that tide has started to shift in the last year. I’ve been to many music festivals and, usually, the way things work is that the crowd sings along to 1-4 songs per act until it comes to the headliners where everyone knows all the words to most of the songs. So when I saw Bleachers and they were going on second to last, I assumed that the crowd probably knew a few of their hits like “Rollercoaster” and “I Wanna Get Better”. What I didn’t expect was that the whole crowd seemed to be there especially for Bleachers, which became evident when they hit the stage. I soon found myself in a crowd of people equally enthralled by Antonoff’s Springsteen-esque, take-no-prisoners rock approach, singing every word to every song from both of their albums. Out of nowhere, it seemed, I found myself in a crowd of people who cared deeply about the same music that I did; the music that had lifted my spirits through break-ups and the loss of a friend. Shepherding me through not with ballads but with anthems. I don’t remember specifically if I cried but it certainly touched me deep and it’s and experience I won’t soon forget.